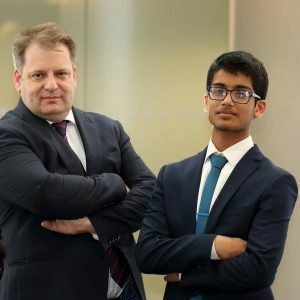 Mir Jawwad Uddin, A student from London Islamic School, has been crowned the 3G Boss 2016, by Channel S and the Canary Wharf Group PLC in a reality TV show which brings together the best young entrepreneurs from the ages of 14-18 years old across the UK. The programme was aired on Channel S for the last 10 weeks, and saw 12 young entrepreneurs who were selected from hundreds of applicants, compete against each other in grueling team based tasks where they demonstrated their competencies in communication, leadership, strategy, skills, knowledge, team spirit and entrepreneurship to be labeled on a weekly basis to save themselves from being fired and be the last one standing as the 3G Boss. The Chief judge for the show was Mr Howard Dawber, Strategic Advisor at the Canary Wharf Group PLC, he was supported by his two successful assistant judges from the Bangladeshi community named Dr Sanawar Choudhury and Kuhinoor Kabir. The weeks leading up to the final involved tasks being varied on a weekly basis starting with an intense interview process, running your own restaurant which involved running a reputable restaurant in Brick Lane and Whitechapel, charity fundraising task, running a promotional campaign for Channel S, designing and selling a new international phone card, promoting and signing members for college courses and writing a business plan for a new innovative product/service designed by the candidates. Jawwad Uddin succesfully got through these tasks being in the winning team on 7out of the 8 tasks and gaining a reputation as the ‘quiet rough diamond’ who had improved as a candidate week by week making his way to the final. The final saw Jawwad coming up against fellow colleague Sadia, another strong candidate from West London who displayed confidence and entrepreneurship over the weeks and labeled a favorite. They were both given the task to come up with an idea for a community project which would need to be planned, researched and presented to the judges with the winning project being fully funded by Canary Wharf Group PLC. Jawwads idea was to set up a methodical system to prepare young people for the new regulation changes to the GCSE’s in 2016, he split this into stages of support which included stage 1, a needs assessment of the young person conducted by a qualified Careers Advisor to map pathways followed by stage 2, a tutoring service to help achieve the end goal and stage 3, a mentoring system where mentors are attached to the young people to build a relationship, go on leisure trips together as a group and support the young person in the pathway to reach the goals set in stage 1. The judges were extremely impressed with his idea but more so with his improvement from the first week and how he had grown so they made the choice to crown Jawwad Uddin as the 3G Boss 2016 and an opportunity to be part of a 6 week apprenticeship at the Canary Wharf Group. A delighted 16 year old ex-London Islamic School student Jawaad Uddin said “I am extremely grateful to London Islamic School for nominating me as a candidate for the 3G Boss as I was not aware of the competition or its value, having gone through the process I have evolved as a well rounded individual and now look forward to my 6 week apprenticeship at the Canary Wharf Group over the summer holidays. I would also like to thank Channel S, the Canary Wharf group, my Teachers, Parents and of course Mr Howard Dawber and the judges for supporting me and having faith in me”.